Rossetti ‘s first Pre-Raphaelite paintings in oils, based on religious themes and with elements of mystical symbolism, were The Girlhood of Mary Virgin (1849) and Ecce Ancilla Domini (1850), both in the Tate Gallery, London. Although he won support from John Ruskin, criticism of his paintings caused him to withdraw from public exhibitions and turn to watercolors, which could be sold privately. 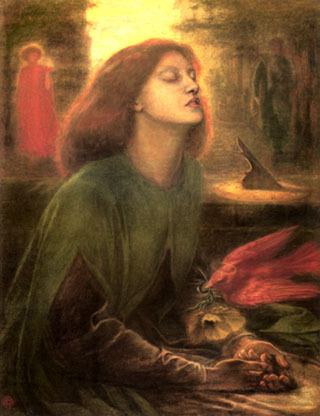 Subjects taken from Dante Alighieri’s Vita Nuova (which Rossetti had translated into English) and Sir Thomas Malory’s Morte Darthur inspired his art in the 1850 s. His visions of Arthurian romance and medieval design also inspired his new friends of this time, William Morris and Edward Burne-Jones. Romantic love was Rossetti ‘s main theme in both poetry and painting. Elizabeth Siddal, whom he married in 1860, was the subject of many fine drawings, and his memory of her after she died (1862) is implicit in the Beata Beatrix (1863; Tate Gallery, London). Toward the end of his life, Rossetti sank into a morbid state, possibly induced by his disinterment (1869) of the manuscript poems he had buried with his wife and by savage critical attacks on his poetry. He spent his last years as an invalid recluse.